An Exciting Report – Cougs for Christ! 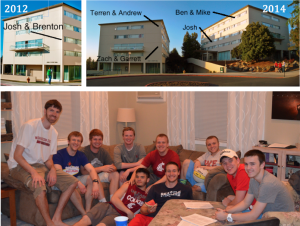 Pray for Josh, Garrett, Zach, Ben, Mike, Terren, and Andrew as they faithfully pursue to share Christ with the people living around them in the dorms. Pray the Lord uses them to make a huge impact in the lives of the freshmen class, and from that the entire campus! Pray for the entire ministry at WSU. Pray for the missionaries on the team there—that the Lord would use all of them to impact students and faculty for Christ among the Greeks, athletes, and academic circles on the campus. Pray for Josh. He is doing pretty well so far in 1st grade but we continue to see him lag socially (complexity and sophistication) but the cool thing is that he is really motivated to hang out with other kids.